The Porsche 917 race car is an icon and it also appeared in the Steve McQueen Le Mans movie, just to cement its coolness. 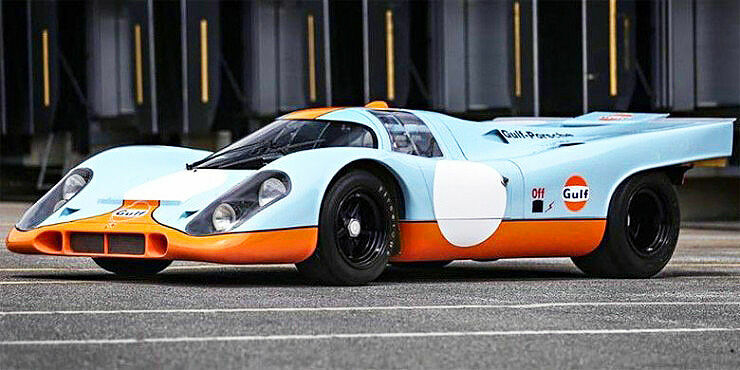 And now the actual Porsche 917 vehicle that was in the film is set to go up for auction. The arrival of the 917 model played a big part in the German car manufacture's history, the Porsche 917 was the car that gave Porsche its first overall wins for the 24 Hours of Le Mans in 1970 and 1971. It was first developed as a prototype in 1969 where it was known as the 12-cylinder 917. Auction house Gooding & Company describe it as "one of the most significant, beautiful, and advanced sports prototype cars in history." And the Porsche 917 in the auction—chassis number 917-024—has got quite the illustrious history. Porsche first used the car at the 1970 Le Mans Tests with British racing drivers Brian Redman and Mike Hailwood (a British Grand Prix motorcycle road racer who was regarded by many as one of the greatest racers of all time) piloting it. However, Redman nailed the fastest lap time driving the Porsche. The Porsche 917 was then sold to factory driver Jo Siffert. He then leased it to Solar Productions, for use in the Steve McQueen Le Mans movie which came out in 1971. The film was directed by Lee H. Katzin and depicted a fictional version of the coveted race. The film crew shot actual footage of the Le Mans race using multiple cameras, which was included in the film. "According to extensive research by noted 917 historian and author the late Walter Näher, 917-024 was utilized as a camera car during production, and also starred extensively during the film." notes Gooding & Company. After starring in the Steve McQueen Le Mans movie Siffert owned the Porsche 917 until he died. It was then used to lead his funeral procession. After that it was sold to a private collector where it remained off the radar for around 25 years. Miraculously it was discovered, practically untouched, in a warehouse outside Paris in 2001 "covered in dust and still in its Gulf JWA livery from Siffert’s ownership." Since then the Porsche 917 has been fully restored by specialist Graber Sportgarage and was finished in 2017. The auction house calls it "surely one of the most correct and significant 917s in existence and easily one of the finest racing cars ever to come to public auction." The car will go up for auction at the 2017 Monterey Car Week taking place in August where it's expected to fetch between $13 million to $16 million. You can check out the Porsche 917 in the Steve McQueen Le Mans movie, below.